An article in “Fisheries” mag­azine in 2009, titled “On the Boots of Fishermen: The History of Didymo Blooms on Vancouver Island, British Columbia,” seemed to cement the idea in the trout fishing establishment. The next thing you knew, states were banning felt soles, advoc­acy groups were begging anglers not to use them and tackle companies all but stopped selling them. Wading shoes with so-called sticky rubber soles became the norm. Now, the author of “On the Boots of Fishermen” has changed his mind. Further research has led Max Bothwell of Environment Canada to a new conclusion: Didymo is native to all of North America and already present in many streams. 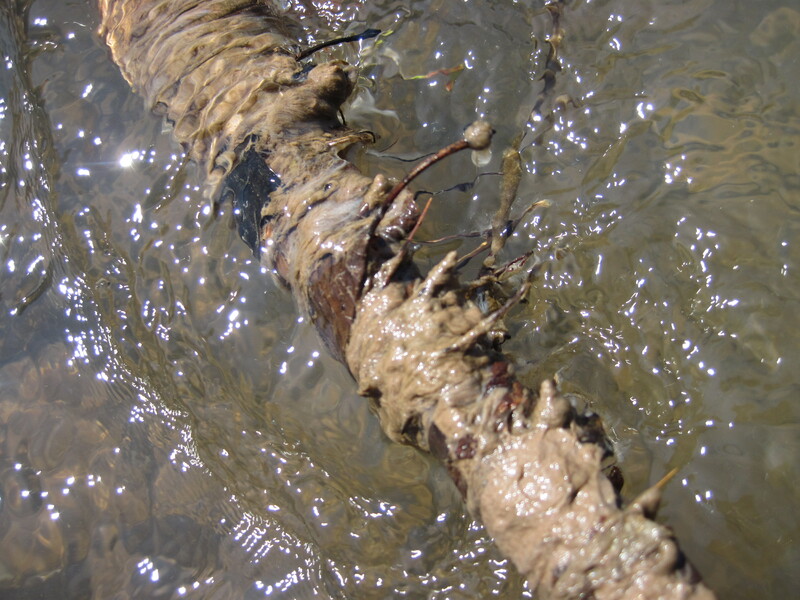 What’s new are the blooms, and Bothwell and colleagues have discovered the blooms are caused by a change in the environment — low levels of phosphorous in the water, which causes didymo to grow the long stalks that become streambed-smothering mats in the worst cases. “I no longer believe the problem with didymo in North Amer­ican streams is the result of it being moved around” by fishermen, Bothwell told me for an article in the July/August issue of “American Angler” magazine. In fact, Bothwell and other scientists added phosphorous to a badly affected stretch of stream in South Dakota, and the didymo bloom there shrank. 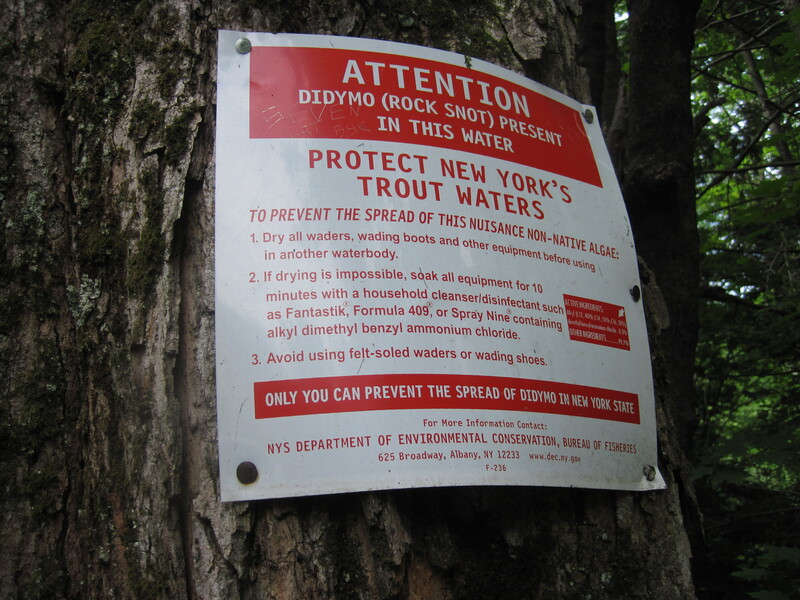 Not all anglers were willing to take the blame for the didymo blooms in the Battenkill River, the branches of the Delaware and Kayaderosseras, Esopus and Schoharie creeks. Many pointed out that wildlife and non-angling humans could also spread spores from stream to stream. They were also annoyed at the idea of being forced to buy a new piece of gear, and one they didn’t trust, at that. After all, previous attempts at non-felt soles were a bust. They just didn’t grip underwater rocks as well as felt. One of them was Ed Ostapczuk of Shokan in Ulster County. Ostapczuk is no skeptic of environmental science in general; on the contrary, he played an important role in the passage of a state law in 1976 that required releases from New York City reservoirs that would protect the trout fisheries downstream, and helped kill a disastrous idea for a pumped water storage power plant in the Catskills. I wasn’t surprised that Ostapczuk found the new thinking about didymo fascinating. But in view of his reluctance to abandon felt for safety reasons, I was surprised to hear his view on modern rubber soles. “I am a CONVERT,” Ostapczuk said in an email. “I love the Simms Vibram sole wading shoes with studs. I personally believe that these grip the stream bottom better than felts. I do too. I’ve been wearing Vibram-soled shoes for several seasons. They grip well enough in the water, and they’re much nicer for walking to the water. And while I may not, in fact, have helped halt the “spread” of didymo, it’s nice to know I may have helped keep other nasty invasives out of our trout streams. The next step is to figure out why rivers across North America and elsewhere are suddenly starved of phosphorous. And correcting that problem is likely to be much more complicated than getting anglers to wear different shoes. This entry was posted in Uncategorized and tagged aquatic invasive species, didymo, felt soles, Max Bothwell, Vibram, wading shoes. Bookmark the permalink. hey mo, another great read. I concur on the sticky rubber plus studs. Works just as well as felt ever did, and fat better traction on shore. Don’t wear them in the grocery store, though — they are useless on a polished lino floor. Worse than useless. I almost knocked over the end cap at the Boiceville IGA.